For the tennis player, see Clay Thompson. Klay Alexander Thompson (born February 8, 1990) is an American professional basketball player for the Golden State Warriors of the National Basketball Association (NBA). He is credited as one of the greatest shooters in NBA history. He is a five-time NBA All-Star, a two-time All-NBA Third Team honoree, and a three-time NBA champion. Thompson is the son of former NBA player Mychal Thompson. He played college basketball for three seasons with the Washington State Cougars, where he was a two-time first-team all-conference selection in the Pac-10. He was selected in the first round of the 2011 NBA draft by Golden State with the 11th overall pick. In 2014, Thompson and teammate Stephen Curry set a then NBA record with 484 combined three-pointers in a season, earning the pair the nickname the "Splash Brothers". In 2015, Thompson helped lead the Warriors to their first NBA Championship since 1975, and was a key contributor in the Warriors' 2017 and 2018 titles. "2008 Washington State Basketball Commitment List". Rivals.com. Archived from the original on February 21, 2017. Retrieved February 21, 2017. "2008 Washington State College Basketball Team Recruiting Prospects". Scout.com. Archived from the original on February 21, 2017. Retrieved February 21, 2017. "Washington State Cougars 2008 Player Commits". ESPN.com. Archived from the original on February 21, 2017. Retrieved February 21, 2017. "Scout.com Team Recruiting Rankings". Scout.com. Retrieved February 21, 2017. "2008 Team Ranking". Rivals.com. Retrieved February 21, 2017. Thompson started all 33 games as a freshman at Washington State University, leading his team in 3-point field goal percentage and free throw percentage, and averaging 12.5 points per game. He was named to the Pac-10 All-Freshman Team and Collegehoops.net All-Freshman Honorable Mention Team. Thompson began his sophomore season by leading the Cougars to the Great Alaska Shootout Championship, being named its Most Outstanding Player after scoring a tournament single game record of 43 points in its championship. This was also the third highest single game point total in WSU history. After becoming the third fastest Cougar to reach 1,000 points, Thompson was named to the All-Pac-10 First Team. He earned Pac-10 Player of the Week honors twice during the season and was chosen as a midseason candidate for the John R. Wooden Award. Thompson finished the season averaging 19.6 points, good for second in the conference. Thompson led the Pac-10 in scoring as a junior, again earning All-Pac-10 first team honors. He became just the third Cougar to win first-team all-district honors from the National Association of Basketball Coaches twice in his career. In addition, he became the first Cougar to be named Pac-10 Player of the Week three times when he won the award for the week of Nov. 22–28, extending the record to four after the week of December 6–12. Soon after, Thompson was named one of the 30 midseason candidates for the John R. Wooden Award. In the 2011 Pac-10 tournament, he set tournament records with 43 points and 8 three-pointers. Thompson finished the season by setting WSU's single season scoring record with 733 points. He is WSU's 3rd all-time leading scorer. Thompson declared for the 2011 NBA draft after his junior season, being selected 11th overall by the Golden State Warriors. This pick of a guard prompted speculation that the Warriors would trade starter Monta Ellis. Warriors general manager Larry Riley praised Thompson for his shooting ability and expressed confidence that Thompson would improve his defensive skills with new coach Mark Jackson. The NBA did not select Thompson for the 2012 NBA All-Star Weekend Rising Stars Challenge. However, in the four games after that decision, Thompson improved in all areas of basketball over his current season averages: points per game (12.5 over 7.6), shooting percentage (54.3% overall including 55.6% for three-pointers, up from 46.7 and 48.1), rebounds (2.8 from 1.6), assists (1.5 from 1.3), steals, and turnovers. The Warriors traded Ellis to the Milwaukee Bucks on March 13, 2012. The following game, Thompson scored a season-high 26 points in a loss to the Boston Celtics. A week later, he exceeded his previous high with 27 points in a win over the New Orleans Hornets. As of mid-February 2012, Thompson played around 17 minutes per game, but he played an average 30 minutes per game during the next month. At the end of the season, Thompson was voted to the NBA NBA All-Rookie First Team. On January 29, 2013, Thompson scored a season-high 32 points against the Cleveland Cavaliers. Warriors coach Mark Jackson said that Thompson and Stephen Curry formed the best shooting duo in NBA history. That season, the two combined made 483 three-pointers, the most ever by an NBA duo. [a] The Warriors defeated the Denver Nuggets in the first round of the playoffs and would be matched up against the San Antonio Spurs. On May 8, 2013, Thompson recorded a playoff career-high 34 points against San Antonio, hitting 8 out of 9 three-point attempts, along with a career-high 14 rebounds. Thompson and the Warriors would go on to lose to the Spurs in six games. In the opening game for the Warriors, Thompson scored a season-high 38 points, including 5-of-7 three-pointers. He and Curry set an NBA record for 484 combined threes on the season, besting by one the record they set the previous year. Thompson averaged 18.4 points, 3.1 rebounds and 2.2 assists on the year. 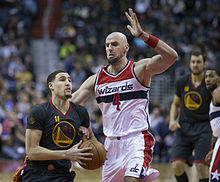 Thompson and the Warriors entered the 2014 NBA playoffs as the sixth seed in the Western Conference and were matched up with the Los Angeles Clippers in the first round; they lost the series in seven games. On October 31, 2014, Thompson signed a four-year contract extension with the Warriors. The next day, he scored a then career-high 41 points in the Warriors' 127-104 win over the Los Angeles Lakers. On January 23, 2015, Thompson scored a career-high 52 points, with 11 three-pointers, in a 126–101 win over the Sacramento Kings. In the third quarter of that game, he scored an NBA-record 37 points for a single quarter, going 13-for-13 from the field, including nine three-pointers (also a league record for a single quarter). The 13 field goals tied David Thompson's (no relation) record for a quarter. [b] On January 29, 2015, Thompson was named a reserve for the 2015 Western Conference All-Star team for the first time in his career. On March 8, 2015, Thompson hit 3 three-pointers against the Los Angeles Clippers to pass head coach Steve Kerr (726) on the NBA's all-time list. On March 17, he was ruled out for 7–10 days with a sprained ankle. That season, Curry broke his own record for three-pointers (286), and Thompson again finished second in the league (239) as the two combined to make 525 threes, surpassing their previous record by 41. On June 7, in Game 2 of the NBA Finals, Thompson scored a playoff career-high 34 points in a losing effort to the Cleveland Cavaliers. The Warriors went on to defeat the Cavaliers in six games to win the NBA championship and end the franchise's 40-year championship drought. 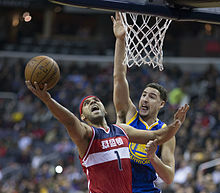 Thompson defending Jared Dudley from the Washington Wizards. Thompson opened the first seven games of the 2015–16 season shooting only 13-of-36 from 3-point range (36 percent). In the last 11 games of November, Thompson then shot a combined 32-of-73 from beyond the arc (43.8 percent). The Warriors' NBA-record start ended at 24 wins when they lost to the Milwaukee Bucks on December 12. 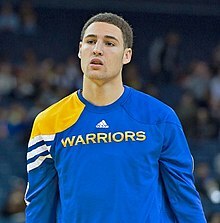 In the Warriors' next game, on December 16, Thompson scored 27 of his then season-high 43 points in the third quarter of their 128–103 win over the Phoenix Suns. On January 8, he recorded his third consecutive game with 30 or more points, finishing with 36 points in a 128–108 win over the Portland Trail Blazers. On January 27, he scored a season-high 45 points on 14-of-20 shooting in a 127–107 win over the Dallas Mavericks. The following night, he was named a Western Conference All-Star reserve for the 2016 NBA All-Star Game, earning his second straight All-Star nod. On February 13, he competed in the All-Star Weekend's Three-Point Contest and won the event after defeating Curry and Devin Booker in the final round. On March 25, he scored 40 points against the Dallas Mavericks. Two days later, he had another 40-point game against the Philadelphia 76ers, scoring 40 points in consecutive games for the first time in his career. On April 7, Thompson scored 14 points against the San Antonio Spurs, helping the Warriors become the second team in NBA history to win 70 games in a season. As the No. 1 seed in the Western Conference, the Warriors faced the eighth-seeded Houston Rockets in the first round of the playoffs. In Game 5 of the series, Thompson became the first player in NBA history to make at least seven three-pointers in consecutive playoff games, as he helped the Warriors advance through to the second round with a 4–1 victory, stepping up with Curry out injured. The Warriors went on to defeat the Portland Trail Blazers 4–1 in the second round, moving on to the Western Conference Finals where they faced the Oklahoma City Thunder. After going down 3 games to 1 following a Game 4 loss, Thompson helped the Warriors rally in Games 5 and 6 to even the series at 3–3. In Game 6, Thompson made a playoff-record 11 three-pointers and scored 41 points, as the Warriors forced a Game 7 with a 108–101 victory. With a Game 7 victory, the Warriors became the 10th team to rally from a 3–1 deficit and win a postseason series. The Warriors went on to lose to the Cleveland Cavaliers in the 2016 NBA Finals in seven games, despite being up 3–1 in the series. Thompson opened the first six games of the 2016–17 season shooting 11-of-53 from 3-point range (20.75 percent). In the last 11 games of November, Thompson then went a combined 39-of-84 from 3-point range (46.4 percent). On December 5, 2016, he scored 60 points (shooting 21-of-33 and 8-of-14 on three-pointers) in 29 minutes over just three quarters in a 142–106 win over the Indiana Pacers, becoming the first player in NBA history to score 60 points in less than 30 minutes of action. Thompson had an NBA season-high and career-best performance for the highest-scoring output by a Golden State player in more than 42 years. His 40 first-half points tied him for second-most scored in a half over the past decade. In addition, Thompson became the first Warrior to score 60 points since Hall of Famer Rick Barry's 64 on March 26, 1974, joining Naismith honorees Wilt Chamberlain and Joe Fulks as the only Golden State players to do so. On January 26, he was named a Western Conference All-Star reserve for the 2017 NBA All-Star Game. He participated in the Three-Point Contest, but he failed to defend his title as he was eliminated in the first round. On April 4, 2017, he scored 41 points (his 10th career 40-point game) in a 121–107 win over the Minnesota Timberwolves. The Warriors finished the season as the first seed in the West with a 67–15 record. Thompson struggled with his shooting for extended stretches during the playoffs, but his defense against opposing guards like Damian Lillard, Patty Mills, and Kyrie Irving stood out. Following a 129–115 victory in Game 4 of the Western Conference Finals over the San Antonio Spurs, the Warriors reached their third straight NBA Finals series, becoming the first team in league history to start the playoffs 12–0. Thompson helped the Warriors win their second championship in three years with a 4–1 series win over the Cleveland Cavaliers in the 2017 NBA Finals. The Warriors finished the playoffs with a 16–1 record, attaining the best postseason winning percentage in NBA history. On October 29, 2017, Thompson scored 29 points in a 115–107 loss to the Detroit Pistons, becoming the 11th player in franchise history to eclipse 9,000 career points. On December 20, 2017, he scored 27 of his 29 points in the first half and made his first nine field goals in a 97–84 win over the Memphis Grizzlies. On December 27, 2017, in a 126–101 win over the Utah Jazz, Thompson hit three 3-pointers, moving him into a tie for third with Dana Barros at 89 consecutive games with a 3-pointer. On January 17, 2018, he scored 38 points in a 119–112 win over the Chicago Bulls. In a 134–127 win over the Los Angeles Clippers on February 22, 2018, Thompson moved past Joe Barry Carroll's 9,996 points to earn 10th place on the franchise's career scoring list, also becoming the 10th Warrior to reach 10,000 regular season career points. Two days later, in a 112–80 win over the Thunder, Thompson passed Neil Johnston (10,023) for ninth place on the franchise's career scoring list. On March 31, 2018, following an eight-game absence with a broken right thumb, Thompson scored 25 points on 10-for-19 shooting in a 112–96 win over the Sacramento Kings. On April 5, 2018, in a 126–106 loss to the Indiana Pacers, Thompson was 4 of 9 on 3-pointers to move past Tim Hardaway (1,542) for 25th on the league's career list. Three days later, he scored 22 of his 34 points in the first quarter of the Warriors' 117–100 win over the Phoenix Suns. Thompson helped the Warriors defeat the San Antonio Spurs in the first round of the playoffs in five games, as he scored 24 points in a 99–91 win in Game 5. As a result, Thompson joined Rick Barry (699) and Curry (652) as Warriors players with 600 postseason field goals. In Game 3 of the Western Conference Finals against the Houston Rockets, Thompson moved past Barry (1,776) for second place on the Warriors' career postseason scoring list. In Game 6, Thompson knocked down nine 3-pointers on his way to 35 points, as the Warriors rallied from an early 17-point deficit to stave off elimination with a 115–86 victory over the Rockets. In Game 2 of the NBA Finals, Thompson played in his franchise-record 100th postseason game. He also became the sixth player to ever make 300 3s in the postseason, joining Curry as Warriors to reach the feat. He scored 20 points in the game to help the Warriors take a 2–0 lead with a 122–103 win over the Cavaliers. The Warriors went on to sweep the series to claim back-to-back titles. Over the first seven games of 2018–19, Thompson shot 5 for 36 from behind the arc and failed to have a 20-point game. He did not make multiple three-pointers in any of the contests, a career-worst seven-game drought for him. On October 29, 2018, against the Chicago Bulls, he hit an NBA-record 14 threes to break Curry's former mark of 13. Thompson scored 52 points in 27 minutes while making 14-for-24 of his threes and shooting 18-for-29 overall from the field. His 10 three-pointers in the first half tied Chandler Parsons' league record set in 2014, and Golden State made 17 threes in the first half to set the NBA record for a half. On November 24, he scored 31 points with five 3-pointers in a 117–116 win over the Sacramento Kings. Thompson moved into 21st place on the NBA's career 3-pointers list when he hit his 1,609th in the first quarter, moving past Jason Richardson. On December 29, he had his second-highest scoring game of the season with 32 points in a 115–105 win over the Portland Trail Blazers. He shot his way out of a slump by hitting 12 of 21 from the field and 4 of 5 from 3-point range. On January 8, he scored 43 points with seven 3-pointers in a 122–95 win over the New York Knicks. On January 21, he tied an NBA record by making his first 10 attempts from 3-point range on his way to scoring 44 points in a 130–111 win over the Los Angeles Lakers. He finished 10 of 11 from beyond the arc and 17 of 20 from the floor overall. On March 8, he scored 39 points and made nine 3-pointers in a 122–105 win over the Denver Nuggets. On March 13, he scored 30 points in a 106–104 win over the Houston Rockets. He made five 3-pointers to give him 203 for the season, joining Curry as the only players in NBA history to have seven straight seasons with 200 3-pointers. Thompson was a member of the United States national team that won the gold medal at the 2014 FIBA Basketball World Cup and the 2016 Rio Olympics. He also won gold as a member of the Under-19 national team at the 2009 FIBA Under-19 World Championship. Thompson is both a prolific and efficient shooter, particularly from range, as well as an elite free-throw shooter. He relies upon a shooting form that has been described as "textbook" and "picture-perfect". Though he is capable of handling the ball in the Warriors offense, Thompson is primarily a catch-and-shoot player, taking advantage of back-cuts and screens set by teammates to make space for his exceptionally accurate quick-release shot. Although Thompson is not known for blocking shots or creating steals, he is considered a strong defender thanks to his size at the guard position and ability to defend against both elite guards and wings. He is also praised for his stamina. Thompson is also known for his quiet, laid-back personality, rarely showing emotion in or out of games. He is one of the few players in the NBA sponsored by Chinese shoe company Anta, signing a 10-year deal with it in 2016. Thompson, was born in Los Angeles, California, to former NBA player Mychal Thompson, who played for the Los Angeles Lakers and currently works in sports radio. Klay's mother is Julie Leslie, a college volleyball player with the University of Portland and University of San Francisco. His older brother, Mychel, played basketball for Pepperdine University and has played in the NBA Development League, most recently with the Santa Cruz Warriors, while his younger brother, Trayce, is a Major League Baseball player with the Chicago White Sox, after previous appearances with the Oakland Athletics and the Los Angeles Dodgers. Thompson faced controversy when he was suspended for his final regular season game at WSU after being issued a misdemeanor criminal citation for marijuana possession. After winning the NBA championship in 2015, Thompson and his father became the fourth father-son duo to win an NBA title, joining Matt Guokas, Sr. and Jr.; Rick and Brent Barry; and Bill and Luke Walton. Thompson is known for his offbeat, dry sense of humor. He owns an English bulldog named Rocco. Thompson is an avid chess player and has met with the chess world champion, Magnus Carlsen. ^ Previous record was 435 by the Orlando Magic's Dennis Scott and Nick Anderson in 1995–96. ^ The 37 points broke the previous record of 33 held by George Gervin and Carmelo Anthony. The nine three-pointers eclipsed the mark of eight by Michael Redd and Joe Johnson. ^ a b c d e f g h i "Klay Thompsons's WSUCougars.com Profile". Washington State Cougars. Retrieved March 7, 2015. ^ Kurtenbach, Dieter (December 7, 2016). "NBA: Klay Thompson's 60 points, the insane stats and the Warriors myth his epic performance busted". Fox Sports. news.com.au. Retrieved February 23, 2019. ^ Letourneau, Connor (December 27, 2018). "Warriors' Klay Thompson on slump talk: 'Don't really care what people say'". San Francisco Chronicle. Retrieved February 23, 2019. ^ a b Milestones, Bleacher Report. "Steph Curry Sets NBA Record for Most Three-Pointers in a Span of 2 Seasons". bleacherreport.com. Retrieved December 6, 2016. ^ "Inside Stuff: Golden State's Splash Brothers - NBA.com". nba.com. Retrieved December 6, 2016. ^ NBA (May 13, 2013). "Like Father, Like Son: Curry & Thompson's NBA Legacies". Retrieved December 6, 2016 – via YouTube. ^ Jayne, Greg (May 11, 2013). "Greg Jayne: On Mother's Day, this mom will watch Klay". The Columbian. Retrieved June 9, 2016. ^ Eggers, Kerry (November 5, 2014). "The boyhood bond of Kevin Love and Klay Thompson". Portland Tribune. Retrieved March 24, 2015. ^ a b "Klay Thompsons's Scout.com Profile". scout.com. Retrieved April 10, 2010. ^ "Year-by-Year Results". GoSeawolves.com. Retrieved December 10, 2010. ^ "2009-2010 Pacific-10 Men's Basketball Honors". gohuskies.com. Archived from the original on September 27, 2011. Retrieved April 10, 2010. ^ "Klay Thompson Named Pac-10 Player of the Week". WSUCougars.com. Archived from the original on July 27, 2011. Retrieved December 9, 2010. ^ a b c "WSU's Thompson following in Fontaine, Weaver footsteps". scout.com. Retrieved March 11, 2011. ^ "2010-11 All-Pac-10" (PDF). pac-10.org. Retrieved March 7, 2011. ^ Smith, Marcia C. (November 30, 2010). "Santa Margarita's Thompson Pac-10 basketball player of the week". ocregister.com. Retrieved March 10, 2018. ^ "Thompson Named Pac-10 Men's Player of the Week". pac-10.org. Retrieved December 14, 2010. ^ "Klay Thompson makes Wooden Award's top 30". scout.com. Retrieved January 6, 2011. ^ "Cougs fall despite Thompson's historic night". Scout.com. Retrieved March 10, 2011. ^ a b "Klay Thompson staying in draft.publisher=espn.com". Retrieved May 8, 2011. ^ a b Simmons, Rusty (June 24, 2011). "Warriors pick a 2-guard: Klay Thompson". San Francisco Chronicle. Retrieved March 29, 2012. ^ a b Simmons, Rusty (February 17, 2012). "Warriors' Klay Thompson growing into a top shooter". San Francisco Chronicle. Retrieved March 29, 2012. ^ Simmons, Rusty (March 28, 2012). "Warriors' Klay Thompson delivers". San Francisco Chronicle. Retrieved March 29, 2012. ^ "Kevin Garnett hits tiebreaking jumper in closing seconds as Celtics edge Warriors". AP. March 14, 2012. Retrieved March 29, 2012. 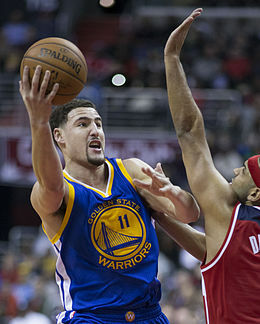 ^ "Klay Thompson's career-high 27 points lift Warriors over Hornets". AP. March 21, 2012. Retrieved March 29, 2012. ^ "Klay Thompson". ESPN. Retrieved March 29, 2012. ^ "Golden State Warriors vs. Cleveland Cavaliers - Recap - January 29, 2013 - ESPN". insider.espn.go.com. Retrieved November 11, 2014. ^ "Curry-Thompson: Best Shooting Pair Ever?". NBA. April 25, 2013. Retrieved April 27, 2013. ^ "Warriors tandem making treys at record pace". NBA.com. Associated Press. April 8, 2013. Archived from the original on April 9, 2013. ^ Page, Justin (April 26, 2013). "Warriors duo prolific from deep". ESPN.com. Archived from the original on May 3, 2013. ^ "Lakers at Warriors". nba.com. Retrieved December 6, 2016. ^ "Warriors Sign Klay Thompson to Contract Extension". NBA.com. October 31, 2014. Retrieved October 31, 2014. ^ Stein, Marc (October 31, 2014). "Sources: Thompson inks 4-year deal". ESPN.com. Retrieved October 31, 2014. ^ "Thompson scores 41, Warriors beat Lakers 127-104". NBA.com. November 1, 2014. Retrieved November 1, 2014. ^ a b "New NBA record: Klay Thompson explodes with 37 points in a single quarter". tvnz.co.nz. January 24, 2015. Archived from the original on January 24, 2015. ^ Simmons, Rusty (January 23, 2015). "Thompson's NBA-record 37-point quarter lifts Warriors over Kings". SFGate.com. Archived from the original on January 24, 2015. ^ Ben Golliver, "Warriors' Klay Thompson sets NBA record with 37 points in a quarter," Sports Illustrated, January 24, 2015. ^ "Klay Thompson Named to Western Conference All-Star Team - Golden State Warriors". nba.com. Retrieved December 6, 2016. ^ "Clippers at Warriors". nba.com. Retrieved December 6, 2016. ^ "Warriors' Thompson (ankle) out 7-10 days". go.com. Retrieved December 6, 2016. ^ "Cavaliers vs. Warriors - Game Recap - June 7, 2015 - ESPN". go.com. Retrieved December 6, 2016. ^ NBA (June 7, 2015). "Klay Thompson Scores 34 Points in Losing Game 2 Effort". Retrieved December 6, 2016 – via YouTube. ^ a b Medina, Mark (October 27, 2018). "Why Warriors blame themselves for Klay Thompson's poor shooting". mercurynews.com. Retrieved October 28, 2018. ^ "Warriors vs Bucks". nba.com. Retrieved December 6, 2016. ^ "Suns vs Warriors". nba.com. Retrieved December 6, 2016. ^ "Warriors vs Trail Blazers". nba.com. Retrieved December 6, 2016. ^ "Mavericks vs Warriors". nba.com. Retrieved December 6, 2016. ^ "Draymond Green and Klay Thompson Named to 2016 Western Conference All-Star Team - Golden State Warriors". nba.com. Retrieved December 6, 2016. ^ "Klay Thompson downs Stephen Curry to win the Three-Point Shootout". yahoo.com. Retrieved December 6, 2016. ^ "76ers vs Warriors". nba.com. Retrieved December 6, 2016. ^ "Spurs vs Warriors". nba.com. Retrieved December 6, 2016. ^ "Rockets vs Warriors". nba.com. Retrieved December 6, 2016. ^ "Warriors vs Thunder". nba.com. Retrieved December 6, 2016. ^ "Thunder vs Warriors". nba.com. Retrieved December 6, 2016. ^ Leung, Diamond (June 19, 2016). "NBA Finals: Warriors lose Game 7 to Cavaliers". MercuryNew.com. Retrieved October 26, 2016. ^ "Thompson Single-Handedly Dismantles Pacers After Historic Scoring Night". NBA.com. December 6, 2016. Retrieved December 6, 2016. ^ "Warriors Pound Pacers Behind Thompson's Historic Night". NBA.com. December 5, 2016. Retrieved December 6, 2016. ^ "Klay Thompson scores 60 for Warriors in rout of Pacers". ESPN.com. December 5, 2016. Retrieved December 6, 2016. ^ Whitaker, Lang (January 26, 2017). "Warriors, Cavaliers dominate selections for NBA All-Star 2017 as reserves are revealed". NBA.com. Retrieved January 27, 2017. ^ "Klay Thompson scores 41, Warriors roll to 12th straight win". ESPN.com. April 4, 2017. Retrieved April 5, 2017. ^ Jones, Kevin (April 12, 2017). "Warriors trounce Lakers, finish regular season with 67-15 record". KNBR-AM. Retrieved May 23, 2017. ^ "Klay Thompson: Impact goes beyond his scoring". San Francisco Chronicle. Retrieved June 18, 2017. ^ "Warriors sweep Spurs, enter NBA Finals 12-0". ESPN.com. Retrieved May 23, 2017. ^ "Warriors (16-1) Record Best Postseason Winning Percentage in NBA History". Bleacher Report. Retrieved June 18, 2017. ^ "Warriors handed second loss at home, fall 115-107 to Pistons". ESPN.com. October 29, 2017. Retrieved October 29, 2017. ^ "Thompson, Durant lead injured Warriors to 10th straight win". ESPN.com. December 20, 2017. Retrieved December 20, 2017. ^ "Warriors bury Jazz with big third quarter, win 126-101". ESPN.com. December 27, 2017. Retrieved December 28, 2017. ^ "Warriors beat Bulls 119-112 for 14th straight road win". ESPN.com. January 17, 2018. Retrieved January 17, 2018. ^ "Curry scores 44, Warriors hold off late rally by Clippers". ESPN.com. February 22, 2018. Retrieved February 23, 2018. ^ "After 2 lopsided losses to OKC, Durant leads Warriors rout". ESPN.com. February 24, 2018. Retrieved February 25, 2018. ^ "Warriors' McCaw injured in scary fall as team beats Kings". ESPN.com. March 31, 2018. Retrieved April 1, 2018. ^ "Pacers sweep season series vs Warriors with 126-106 romp". ESPN.com. April 5, 2018. Retrieved April 5, 2018. ^ "Thompson, Warriors beat Suns for 15th straight time". ESPN.com. April 8, 2018. Retrieved April 9, 2018. ^ "Durant, Green lead Warriors past Spurs into second round". ESPN.com. April 24, 2018. Retrieved April 24, 2018. ^ "Curry comes alive to score 35, Warriors rout Rockets by 41". ESPN.com. May 20, 2018. Retrieved May 21, 2018. ^ "Klay Thompson score 35, Warriors force Game 7 in West finals". ESPN.com. May 26, 2018. Retrieved May 26, 2018. ^ "Curry dazzles from deep, Warriors take 2-0 NBA Finals lead". ESPN.com. June 3, 2018. Retrieved June 4, 2018. ^ "Curry sets another record for 3s, Warriors hold off Nets". ESPN.com. October 28, 2018. Retrieved October 28, 2018. ^ Slater, Anthony (October 29, 2018). "Five observations from Klay Thompson's record-breaking 3-point night in Chicago". The Athletic. Retrieved October 31, 2018. (Subscription required (help)). ^ Friedell, Nick (October 29, 2018). "Klay Thompson breaks NBA record for 3's in a game with 14 vs. Bulls". ESPN.com. Retrieved October 29, 2018. ^ "Durant scores season-best 44 points, Warriors hold off Kings". ESPN.com. November 24, 2018. Retrieved November 25, 2018. ^ "Warriors beat Blazers to avenge earlier loss this week". ESPN.com. December 29, 2018. Retrieved December 30, 2018. ^ "Thompson scores 43, Warriors beat Knicks to snap home skid". ESPN.com. January 8, 2019. Retrieved January 9, 2019. ^ "Thompson hits first 10 from 3, Warriors beat Lakers 130-111". ESPN.com. January 21, 2019. Retrieved January 22, 2019. ^ "Thompson returns with 39, Warriors bounce back, beat Nuggets". ESPN.com. March 8, 2019. Retrieved March 9, 2019. ^ "Warriors, minus Durant, end Rockets' 9-game streak, 106-104". ESPN.com. March 13, 2019. Retrieved March 14, 2019. ^ "Adande: Klay Thompson's stroke of genius". ESPN.com. Retrieved August 6, 2017. ^ Murphy, Dylan. "Breaking Down Klay Thompson's Picture-Perfect Jump Shot". Bleacher Report. Retrieved August 6, 2017. ^ "Klay Thompson arguably Warriors' most explosive scorer". SFGate. Retrieved August 6, 2017. ^ a b "Warriors film room: The uniqueness of Klay Thompson's game". The Mercury News. March 24, 2017. Retrieved August 6, 2017. ^ Howard-Cooper, Scott. "'Splash Brother' Klay Thompson can win games with his defense". NBA.com. Retrieved August 6, 2017. ^ "Klay Thompson won't be fazed by missed shots, James Harden or anything else". Sporting News. May 20, 2015. Retrieved August 6, 2017. ^ a b "How Klay Thompson Became More Valuable Than Ever – The Ringer". The Ringer. April 12, 2017. Retrieved August 6, 2017. ^ II, Michael D. Sykes (June 30, 2017). "Klay Thompson signed a 10-year shoe deal with Anta. Here's what it means for his NBA career". SBNation.com. Retrieved August 6, 2017. ^ Friedell, Nick (October 30, 2018). "Klay Thompson on record 14 3s: 'Just knew I was due for a big night'". ESPN.com. Retrieved November 1, 2018. ^ "NBA & ABA Single Season Playoff Leaders and Records for 3-Pt Field Goals". Basketball-Reference.com. Retrieved June 20, 2016. ^ Bolch, Ben (March 4, 2011). "Washington State star Klay Thompson is suspended for game against UCLA". Los Angeles Times. Archived from the original on March 20, 2011. ^ Simers, T. J. (March 5, 2011). "No excuses from Mychal Thompson after Klay Thompson's indiscretion". Los Angeles Times. Archived from the original on March 20, 2011. ^ Bolch, Ben; Holmes, Baxter (March 7, 2011). "UCLA awaits word on condition of Malcolm Lee's left knee". Los Angeles Times. Archived from the original on March 19, 2011. ^ Stubbs, Brent (June 19, 2015). "'All He Has To Do Is Stay Humble'". tribune242.com. Archived from the original on July 23, 2015. ^ "Warriors' Klay Thompson quietly gets the job done". Retrieved August 6, 2017. ^ "Warriors' Klay Thompson taking star turn in playoffs". SFGate. Retrieved August 6, 2017. ^ "For Warriors' Klay Thompson, time with dog is time well spent". SFGate. Retrieved August 6, 2017. ^ "Klay Thompson turning points into money". The Mercury News. October 30, 2017. Retrieved October 30, 2017. ^ "Fans Pledge. Teams Perform. Everyone Wins! - PledgeIt.org". pledgeit.org. Retrieved October 30, 2017. ^ Nathan, Alec. "Klay Thompson Introduced Himself to Magnus Carlsen as Warriors' Best Chess Player". Bleacher Report. Retrieved February 15, 2019. ^ Cohen, Ben (May 30, 2018). "The Warriors' Key Chess Piece Is Also a Chess Fanatic". Retrieved February 15, 2019 – via www.wsj.com. ^ Dowd, Katie; SFGATE (May 30, 2018). "Klay Thompson is so obsessed with chess, he consulted with a Norwegian grandmaster". SFGate. Retrieved February 15, 2019. Wikimedia Commons has media related to Klay Thompson.